Powder-X is pleased to supply one of the best application guns in the industry – and the only gun with a five-year warranty – in the Gema OptiFlex®2. The Gema OptiFlex®2 has the ability to charge and spray a number of different powders using Precision Charge Control (PCC). 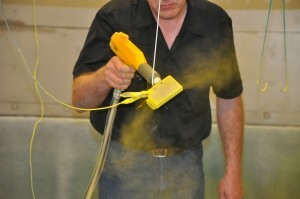 The design of its pump allows for the least amount of powder waste possible, while PowerClean™ uses intense amounts of air to clean the entire path the powder travels from the pump to the gun’s tip, allowing for easier color changes.